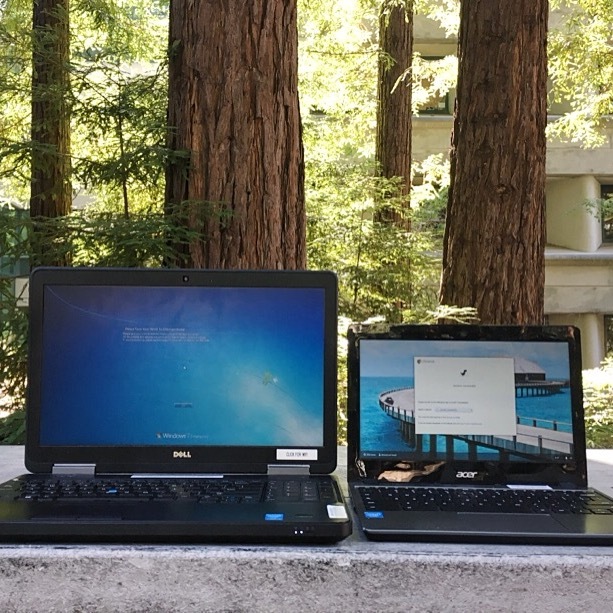 Current UCSC students, faculty, and staff may borrow Dell laptops and Chromebooks from the Science & Engineering Library Circulation Desk and the McHenry Library Circulation Desk. They are available on a first-come, first-served basis. They may be reserved one day in advance. One laptop per person may be checked out. The loan period is 4 hours. Renewals are allowed when there is no one waiting. Renewals must be done in person. Failure to return the equipment on time will result in an hourly fine. The borrower agrees to return the equipment in the same order and condition as when received and if such equipment is damaged or lost while on loan, agrees to reimburse the university for the costs of repair or replacement with new equipment of the same type. Overdue charges of $2.00 for each hour or partial hour until a maximum of $75.00 in fines are assessed if the equipment is not returned on time. Laptop replacement fees will be assessed if it is not returned. Please report loss, damage, or defect to the Circulation Desk immediately. Printing is currently unavailable from the circulating laptops. Please do not leave the library equipment unattended. You are responsible for equipment checked out to you. For technical questions about the operation of the library laptops, please go to the IT Help Desk. Please report any hardware or software problems to Circulation staff when returning the laptop. The library also offers other equipment for checkout, including calculators, power adapters, audiovisual adapters, and bicycle locks. For more information and availability, please inquire at the circulation desks.